Thank you! We will reach out to you within 24 hours. Much Metta! Ayurveda is the art of self healing. During the session, Jitka will offer you personal advice on the best diet, lifestyle, and herbal treatments for any ailments you deal with or even just for a healthier, happier life. Through tongue, pulse, eye, face, nail and subjective readings, Jitka will asses you your doshic balance and imbalance and advise the most suitable steps from that perspective. This session includes optional 10-minute phone call prior to the session to answer any of your questions and 3-week personal email support with helpful handouts, recipes and daily lifestyle tips. A follow-up session after the initial consultation to continue and support the client on the new path to a well-being and new goals. Reiki is an ancient Japanese method of energy healing that balances the body and mind. Reiki supports the physical, mental, emotional and spiritual well-being and is suitable for adults, babies, toddlers, children, elderly and pets. For its recognized benefits, reiki is often used as a complementary therapy in hospitals. Benefits of reiki include: stress reduction and relaxation, immunity boost, deeper sleep and overall improved well-being. Reiki balances the mind and emotions and it creates inner peace and harmony. It can help alleviate mood swings, fear, frustration and anger. Reiki improves relationships. It offers relief during emotional distress and it helps in the grieving process. Reiki helps to relieve pain from migraine, arthritis, sciatica ~ just to name a few. It also helps with symptoms of asthma, chronic fatigue, and menopausal symptoms. Reiki speeds up recovery from surgery or long-term illness. It helps in adjusting to medicine/treatment and tends to reduce side-effects. Traditional Thai Massage (bodywork) is a form of movement therapy taking place on a cushioned mat laid on the floor. Thai bodywork rarely uses oils or lotions, and the recipient remains clothed during a treatment. There is constant body contact between the practitioner and client, but rather than rubbing on muscles, the body is compressed, pulled, stretched and rocked. Through successive treatment; joints are opened, muscles and tendons are lengthened, internal organs are toned, and energy is balanced. This is achieved by incorporating gentle assisted yoga postures and acupressure with the use of thumbs, palms, forearms, elbows, knees and feet to create movement on the entire body of the recipient. The style of bodywork Carlos practices involves a focused mind, gentle movement, loose body with a soft but firm touch. By remaining relaxed during a session, both practitioner and receiver gain the benefits of a strengthened physical and mental well-being. 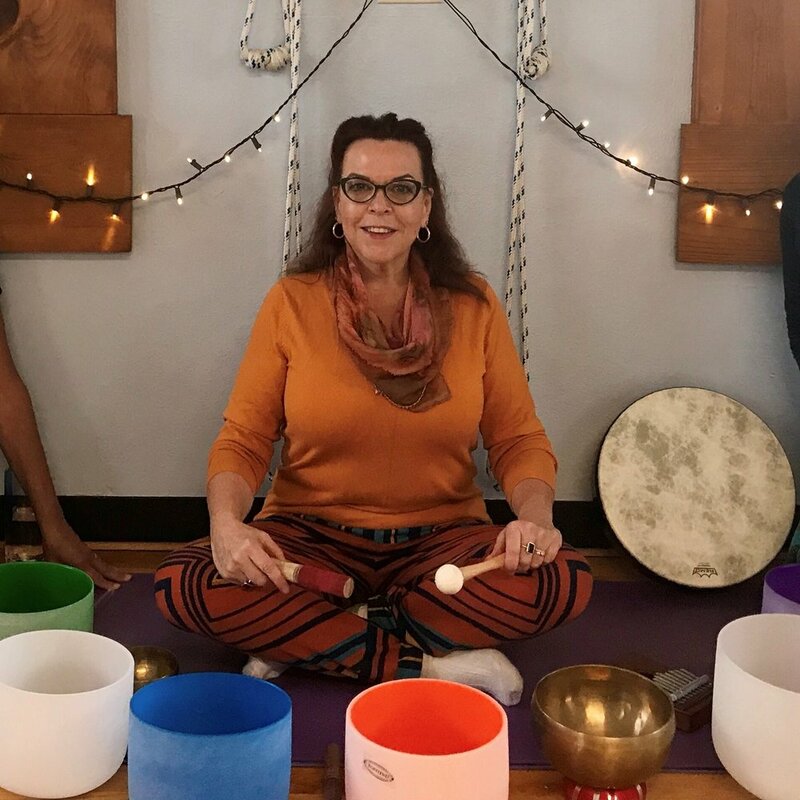 Liz Mandeville will guide you on a sound journey using crystal singing bowls, tuning forks, shamanic drumming, and other various instruments. Sound baths are meant to facilitate a shift in your brain wave state, so that a deep state of meditation and internal healing can occur. This is perfect for beginning meditators that have not yet learned how to facilitate a shift in brain wave state on their own. More experienced meditators will find their ability to reach a theta state (deep meditation) or even a delta state (where internal healing can occur).